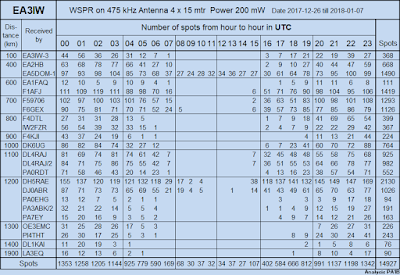 WSPR reveals the daily changes in propagation. It is not a surprise to see that in the 472 kHz band most spots are made during the night. As you can see most spots are made in the hour of 23 UTC and 00 UTC. Click on the table to enlarge. Albert EA3IW made WSPR spots on 475 kHz over a distance up to 1900 km. 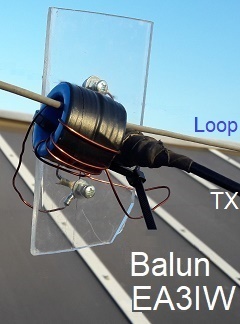 Albert uses a square loop of 4 x 15 meters with 2.5 mm2 Cu wire. The antenna is small relative to the wavelength. Because of this the efficiency of the antenna is low. Calculations show that the radiated power is about 200 milliwatt. The spots were made from 26th of December 2017 till the 6th of January 2018. To reduce the length of the table, I only show the data of the receiving stations, that reported during all of the days that are shown in the table. The WSPR signal was heard up to 1900 km. In the table the stations are sorted by distance. The column of 200 mW shows the spots that were just strong enough to be decoded. The column of 20 mW and 2 mW show the spots that were 10 dB stronger and 20 dB stronger. The lower the Lowest possible power the stronger the signal. EA3IW-3 is a receiver at a distance of 100 km of the transmitter of Albert. 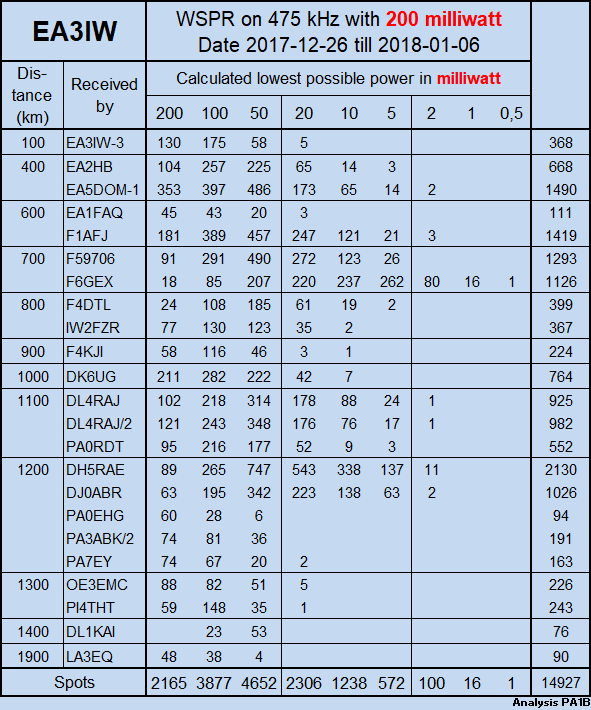 The table shows that in 130 spots the full power of 200 mW was needed to be heard. 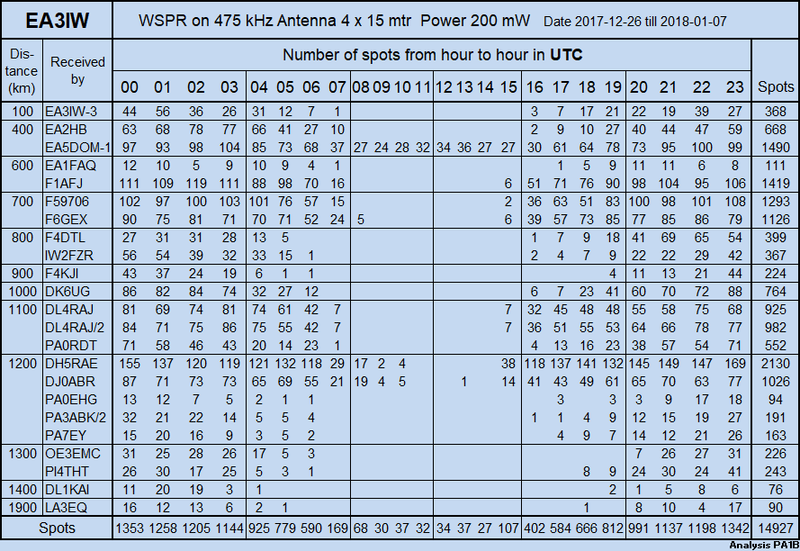 205 Spots could have been made with 100 mW and 5 spots even be received if they were made with 20 mW. The spots of EA2HB show a dynamic range of 16 dB, from 5 mW to 200 mW. The most sensitive station is F6GEX. The one spots with the strongest signal, could have been made with 0.5 mW. Notice that 262 out of 1126 spots, received by F6GEX, could have been made with 5 mW. The difference between the spots with 200 mW and the strongest spot (0.5 mW) is 26 dB. The results show that it is possible to use WSPR with a low power even on 475 kHz. The changes in propagation are best seen, when you run WSPR 24 hours a day. Thanks to Albert, for the interesting low power results and the pictures that I received. Click to discover how to calculate the Calculated lowest possible power. The cylinder dipole with two Monster energy drink cans and a coil is easy to build and is working fine on 15 m. With 2.5 % of a wave length, it is very small antenna, that can be easily used indoors. Building and operating with the cylinder dipole is not as difficult as it seams. There are no critical parts or critical procedures. I wish you good luck, but most of all to have fun.